With the wealth of mobility products and specialist healthcare equipment on the market today, we understand what a challenging task it can sometimes be for healthcare professionals to prescribe the very best solution for a client’s specific needs. To help occupational therapists, physiotherapists and other clinical professionals improve their knowledge on the latest innovations, Independence Mobility are committed to providing education resources and training opportunities. We understand that an OT’s time for training is often very limited, so our free lunch & learn training sessions are designed to give clinical teams a quick overview on a specific subject area at a time and a location that’s convenient for you. Prescribing the correct piece of equipment for a client’s unique and individual needs can have a big, positive impact on the quality of their life. Here are some case studies showing how some of our products have done just that. Due to certain medical conditions and disabilities, many people spend a lot of time sitting or confined to their beds. These conditions can sometimes cause secondary postural or medical complications which can make it more challenging to seat the person correctly. Incorrect seating can have a negative effect on a person’s social and physiological wellbeing and can reduce their ability to be independent, so it’s incredibly important to consider these medical conditions when prescribing specialist seating. Click on the conditions below to find out more *. Alzheimer’s disease is the leading form of dementia found in elderly patients marked by the slow degeneration of a person’s cognitive function due to impaired communication between nerve cells in the brain. Alzheimer’s disease is associated with severe loss of memory and changes in behaviour. As the disease progresses, the symptoms change and can become more exaggerated, especially as the individual’s memories become more and more short term. Becoming as familiar as possible with these signs and symptoms can help caregivers recognise any progression that is happening. For family members, knowing about Alzheimer’s and what to look for can make it easier to care for and understand individuals with the disease. It is very important that the chair is multi adjustable enabling it to meet the changing needs of the person as their condition changes. Cognitive changes may reduce the patient’s ability to ‘learn’ new products and operations and so having a chair that will adjust easily and which accessories can be added to as needed, will ensure continuity and familiarity. The Sorrento™, Phoenix™, Atlanta™ and Monaco™ chairs in particular are designed to suit the needs of those with Alzheimer’s disease and dementia. The Phoenix and Sorrento are helpful in the later stages of Alzheimer’s disease when muscular function is lost. The Seating Matters Phoenix and Sorrento chairs are highly adjustable, providing full body support and pressure management. Accessories can be added to the chairs at a later date as and when they may be required, to meet patient’s changing needs as they evolve over a period of time. Both the Sorrento and Phoenix come in manual and powered options. 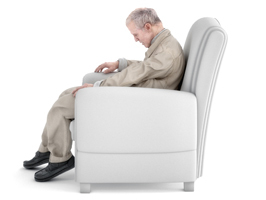 Manual adjustment leaves the control of the seating positions to the caregiver. 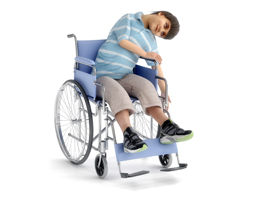 Partially motorized options give the user of the chair more independent control to change the angle of tilt in space and their leg elevation as and when desired. Fully motorized options give the user of the chair control to change the angle of tilt in space, their leg elevation and the back angle recline as and when desired. 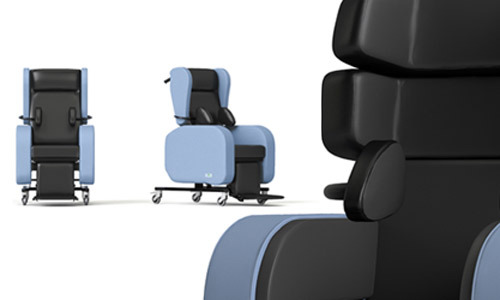 The Atlanta is particularly helpful in patients who suffer involuntary movements and can be challenging to seat. People with these symptoms may have an increased risk of falling out of their chairs because they forget that they are not as strong as they once were. The seat depth, high arm rests and leg rests keep the individual safe, supported and snug within their chair. If your patient or loved one is at high risk of falls you may find this blog on the subject helpful. For those who have good skin with low pressure risk, and a degree of independent mobility, the Monaco provides lateral support and pressure management whilst maintaining the patient’s independence. Brain injuries are caused by external force or trauma jarring the brain, causing varying degrees of brain dysfunction. This usually happens due to a violent blow to the head or body or an object penetrating the skull. Mild brain injuries may only have a temporary dysfunction of brain cells. More serious brain injuries can lead to bruising on the brain, torn tissues, bleeding and physical damage to the brain that can lead to long-term complications or death. If a person with a brain injury is not treated right away or the injury is severe enough, long-term complications may occur. If you see someone sustain a head injury, watch for the above symptoms and if any are noticed, bring the patient to the doctor right away. It is very important that the chair is adjustable to allow it to meet the changing needs of the person as their condition changes. Cognitive changes may reduce their ability to ‘learn’ new products and operations and so having a chair that will adjust and to which you can add accessories at a later date, will ensure continuity and familiarity. The Sorrento™ and Phoenix™ in particular are designed to suit the needs of those suffering from a brain injury and these are also available as part of our Kidz Range, as well as for adults. These two Seating Matters chairs are highly adjustable and highly supportive and can be used as rehabilitation tools, with accessories that can be added or taken away as necessary. This allows one chair to meet changing patient needs over a long period of time. Both the Sorrento and Phoenix are available in manual and powered options. 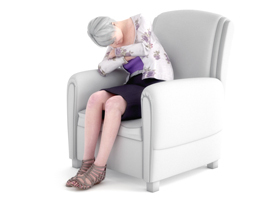 Manual adjustment leaves the control of the seating positions to the caregiver. 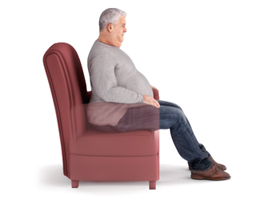 Partially motorized options give the user of the chair more independent control to change the angle of tilt in space and their leg elevation as and when desired. Fully motorized options give the user of the chair control to change the angle of tilt in space, their leg elevation and the back angle recline as and when desired. Depending on the severity of the injury, Sorrento and Phoenix can provide the exact amount of support a person needs. They can be adjusted to provide less support as rehabilitation routines work to make the user stronger. If the injury causes the user’s health to deteriorate, these chairs can be adjusted to include greater amounts of support as well. 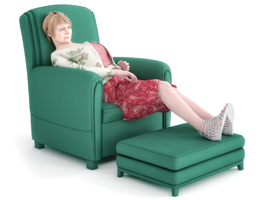 If an individual suffers from symptoms that include involuntary movements, the Atlanta™ is a fantastic option. The Seating Matters Atlanta provides a safe and padded position, robust enough to withstand constant, vigorous, involuntary movements. The high arm rests and ramped seat of the Atlanta provide a safe and comfortable position without the patient feeling like they are being restrained in their seat. Motor neuron disease is the destruction of nerve cells in the brain and spinal cord that control the ability to use muscles and it typically manifests after forty years of age. Nerve cells that are affected are the upper motor neurons from the brain to the spinal cord and lower motor neurons that enter the muscles further away from the spine. Scarring of the ends of upper motor neurons in the spinal cord is termed lateral sclerosis, which causes spasticity. Degeneration of the lower motor neurons leads to amyotrophy, the wasting away of muscles. In this condition, there is nothing intrinsically wrong with the muscles themselves, they just are not getting the electrical impulses needed to make them move, thus allowing them to waste away. People can have varying degrees of motor neuron disease. They may only have lateral sclerosis occurring, or only amyotrophy, or both. When a person has both together they are said to have amyotrophic lateral sclerosis (ALS) (also known as Lou Gehrig disease), which makes up 90% of cases of motor neuron disease. Although bladder and bowel muscle movements are not affected, the ability to get up and bring oneself to the bathroom deteriorates as the disease progresses. Be prepared for accidents to happen and don’t get mad at the patient for things they can’t control. It is very important that the chair is adjustable to allow it to meet the changing needs of the person as their condition changes. For patient’s with motor neuron disease/ALS, the chair will need to become more supportive as time goes on and it is good to start with a chair that you can add accessories to as new symptoms arise. The Sorrento™ and Phoenix™ in particular are designed to suit the needs of those with MND/ALS, especially in later stages of the disease where muscular function is decreased. These two Seating Matters chairs are highly adjustable and accessories can be included at a later date if they are not needed at the initial assessment. This allows the chair to meet changing needs over a long period of time. Multiple sclerosis is an autoimmune disease in which the body’s cells fail to recognize other cells as part of the body and attacks them. In MS, the cells being attacked are called myelin, which are a layer of protein that protects nerve fibres in the spinal cord and helps with the transmission of electrical signals from the brain to the rest of the body. The damage to these cells disrupts the transfer of these nerve signals, therefore causing problems with muscle movement, balance and vision. It is very important that the chair is adjustable to allow it to meet the changing needs of the person as their condition changes. Cognitive changes may reduce the patient’s ability to ‘learn’ new products and operations and so having a chair that will adjust easily and can add accessories as needed will ensure continuity and familiarity. The Sorrento™ and Phoenix™ in particular are designed to suit the needs of those with MS. These two Seating Matters chairs are highly adjustable and accessories can be included at a later date if they are not needed at the initial assessment. This allows the chosen chair to meet the changing needs of the patient over a long period of time. Parkinson’s disease is the destruction of nerve cells and depletion of dopamine, a chemical in the body responsible for smooth normal movements. It can be caused due to a genetic predisposition or environmental factors like exposure to metal poisoning, viral infection or side effects to drugs. People are living longer and so the incidence of Parkinson’s disease has increased as the disease is related to age. By the time symptoms of Parkinson’s disease develop, half of the dopamine producing cells have in the body have already died. Work with an Occupational Therapist to learn new ways to perform daily activities independently. If the person is tired, let them sleep. Arrange activities to accommodate their change in sleep patterns as best as you can. It is very important that the chair is adjustable to allow it to meet the changing needs of the person as their condition changes. Cognitive changes may reduce the patient’s ability to ‘learn’ new products and operations and so having a chair that will adjust easily and which you can add accessories to as needed will ensure continuity and familiarity. The Sorrento and Phoenix in particular are designed to suit the needs of those with Parkinson’s disease. These two Seating Matters chairs are highly adjustable and can provide support to all parts of the body, especially at the head, protecting the individual from head or neck injuries due to their uncontrolled tremors. All accessories can be included at a later date if they are not needed at the initial assessment. This allows the chair to meet changing needs over a long period of time. For those who have good skin and a degree of mobility, the Monaco™ provides lateral support and pressure management cushions. Meningocle is the rarest form of Spina bifida that occurs when the meninges(ii) surrounding the spinal cord push out through openings in the vertebrae. The spinal cord still develops normally so the defect can be fixed with surgery with little to no damage to the nerves. * Please note: This information is for guidance only. It is important to seek specific advice from a medical practitioner that is familiar with the individual needs of the patient being considered. Check out the videos below for help and advice on prescribing mobility equipment and specialist healthcare products.